Posted in Associations, Government, Immigration, News, under Europe. Prominent champions of the UK’s international education sector set an upbeat tone at this year’s StudyWorld event, urging the sector to take its own lead on engaging internationally. "The next step is take international students out of the net migration figures"
In the same week as the latest THE rankings revealing Oxford and Cambridge in the leading positions. 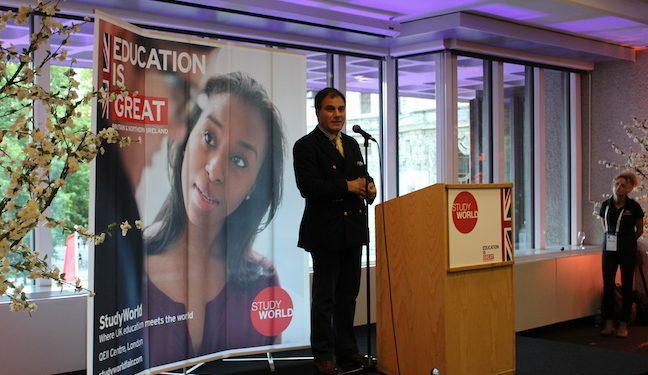 Lord Bilimoria, co-chair of the All Party Parliamentary Group on International Students, addressed delegates and reminded them of the UK’s outstanding academic reputation and evolving political landscape. Revealing that four generations of his family in India studied in the UK, Bilimoria – well known as the founder of the Cobra beer empire – underlined his commitment to strengthen opportunity for British education exports. Bilimoria is also chancellor of the University of Birmingham and he pointed to the fact that Birmingham is opening a campus in Dubai as illustrative of transnational activity. “I hope that message gets round, and the next step, which I do hope the government will do, is take international students out of the net migration figures”, Bilimoria said, to be greeted with cheers. Well known journalist Gavin Esler said that a documented lack of trust in experts must be combated by UK’s universities adopting an “only connect” strategy, in a keynote address. And Vivienne Stern, director of Universities UK International, followed Esler’s proactive call with a message that Brexit should be seen as an opportunity. “Since the [EU] referendum we have hit the road,” she told English UK members and officials from the Department of International Trade’s global offices. “We’ve attended 13 events across Europe to speak to students and influencers. We need to listen to what others want, and that’s the upside of Brexit”. The final speaker of the keynote slot was Mark Garnier, the junior minister in the UK’s Department for International Trade. He ended with another analogy for Brexit. “It is very possible that in a few years students may be asked the question: ‘Has the UK benefitted from Brexit?’. I want students to be able to confidently answer ‘Yes’,” he said. The three day UK-only focused event, situated as it was in the shadow of Westminster, was sure to be dominated with talk of Brexit and politics. But with the calls for action and warnings on the effects of inaction, the atmosphere was not claustrophobic but encouraging of openness and collegiality.